As I mentioned in my introductory blog post, one of my first research areas is going to be the production of Greek plays on British television from the 1950s, when the first Greek play appears to have been televised (although there are occasional tantalising clues to earlier productions which I am keen to follow up). 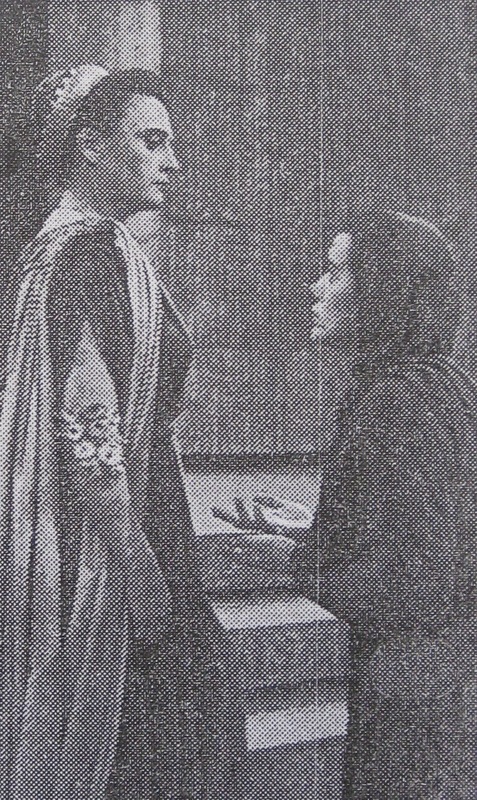 The first well documented broadcast is a 1958 BBC World Theatre production of Women of Troy. Euripides’ harrowing tragedy follows the fates of the women after Troy has been sacked and their husbands killed. The women are allocated as spoils of war to Greek heroes, Polyxena is slaughtered as a sacrifice to the gods and the infant Astyanax is thrown to his death from the battlements of Troy, to prevent him from later avenging the death of his father Hector―strong stuff for stage or television. Indeed, The Manchester Guardian’s ‘Television Critic’ found the broadcast of the play, produced by Michael Elliott and Casper Wrede, to have been ‘the most unsettling experience in [my] last half dozen years of theatre or television attendance’ (The Manchester Guardian, 13 January 1958, p. 5). I’ll say much more about Women of Troy in one of my next blog posts [posted on 22 June 2011 and available here]. Today my aim is to offer a taster of the range of productions of Greek drama on British television across the half century from the 1950s. 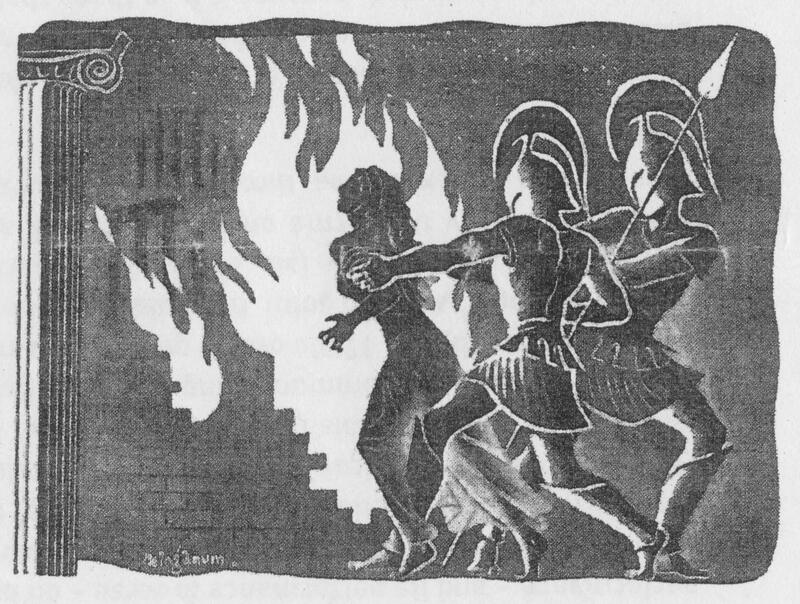 Kenneth Cavander (whose translation had been used for Women of Troy) provided the translation for Sophocles’ Philoctetes which was produced as a half hour programme for BBC Schools in 1961. In the same year, a television version of Aeschylus’ Oresteia trilogy seems to have been produced for schools by ITV. Associated-Rediffusion continued with the Greeks in 1963, broadcasting a series called Theatres and Temples which included extracts of Euripides’ Iphigenia at Aulis and a three-part broadcast of Euripides’ Medea, directed by Robert Stead (which seems to have been re-broadcast in six parts for schools in 1964). My preliminary research on Greek plays on British television so far reveals nothing after the 1964 BBC Lysistrata until 1969―that is, with the exception of Tom Stoppard’s 1968 Neutral Ground, an adaptation of Sophocles’ Philoctetes which was produced by Granada and broadcast by ITV but which, as a play written specifically for television, falls outside of the confines of our study. Shortened and adapted forms of Sophocles’ Antigone and Aristophanes’ Peace, intended for children aged 11 to 12, were broadcast as part of a series titled Heritage early in 1969. Sophocles seems to have been a popular choice at the BBC in the 1970s. In 1974, Michael Lindsay-Hogg directed Electra in the translation by E. F. Watling [this is the subject of my 26 August 2011 blog post]; and in 1977 the BBC co-produced Oedipus the King with The Open University. 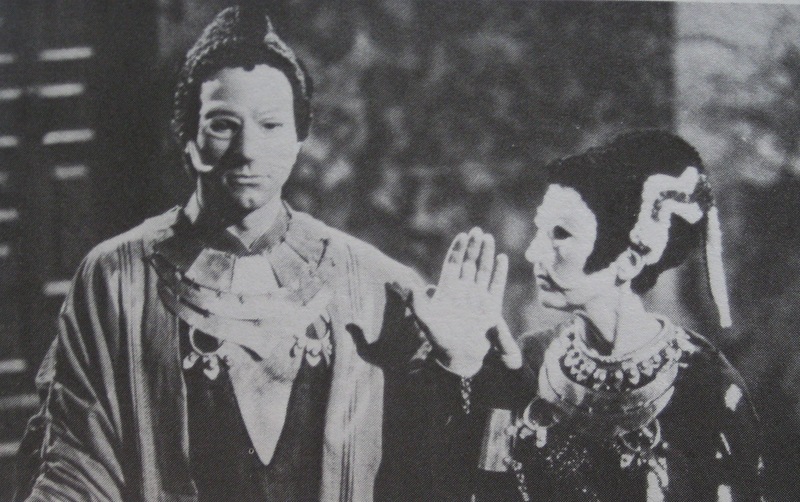 This co-production, featuring half-masks and Patrick Stewart in the title role (pictured here), was one of a series of sixteen made to support The Open University course A307 Drama (other plays in the series include Shakespeare’s Macbeth, Congreve’s The Way of the World, Ibsen’s Peer Gynt, Beckett’s Waiting for Godot and Fugard’s Sizwe Bansi is Dead). At the end of the decade, however, the BBC turned to Aeschylus with The Serpent Son, a production of the Oresteia trilogy broadcast on BBC2 in three instalments in 1979. The director was Bill Hays and the translation was that by Kenneth McLeish and Frederic Raphael. Clytemnestra was played by Diana Rigg (pictured here), Agamemnon by Denis Quilley and Cassandra by Helen Mirren. Billie Whitelaw led the chorus of women and Siân Phillips was the leader of the Furies. The Oresteia was televised again four years later in 1983. 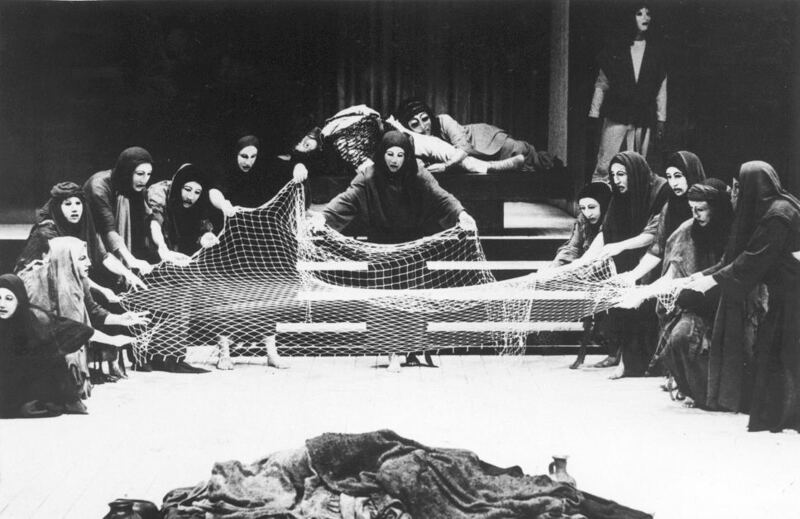 This Channel 4 broadcast was a recording of the stage production of Tony Harrison’s translation of the play, produced for the National Theatre by Peter Hall in 1981 (pictured here) which, in 1982, had the accolade of being the first non-Greek production to be performed in front of an audience in the ancient Greek theatre at Epidaurus. In 1986 the BBC broadcast The Theban Plays, a trilogy of Sophocles’ Oedipus the King, Oedipus at Colonus and Antigone. Don Taylor both translated the plays and directed the productions which starred Claire Bloom as Jocasta, John Gielgud as Tiresias, Anthony Quayle as Oedipus, John Shrapnel as Creon and Juliet Stevenson as Antigone. (Oedipus the King is available on YouTube; the other two plays are also available, but the quality of the recordings is poor.) The series of three plays was considered by The Sunday Telegraph to have been ‘one of the most formidable television entertainments of the decade’ (The Sunday Telegraph, 21 September 1986, p. 16) and Taylor’s translation ‘aggressively contemporary’ (The Independent, 17 September 1986). The reviewer in The Independent goes on to make the thought-provoking point that ‘the conventions of a studio-bound BBC play are probably just as stifling as those of ancient Greek theatre’. The preliminary survey ends with a brief reference to another Don Taylor translation and production for the BBC: Euripides’ Iphigenia at Aulis which starred Roy Marsden as Agamemnon and Fiona Shaw as Clytemnestra. Really interesting stuff. Two things that occurred to me, which you’ve probably already got pegged for future research: the first was the differences in production for plays commissioned directly for television (and its mass audiences) and those adapted from the stage (with its elite audiences) – and what those differences say about the inherent paternalism in BBC programming; the second was the impact of casting – many of those mentioned had already (or were later to) act in films set in the ancient world – so how did those cultural associations work for mass audiences who might have been more likely to visit the cinema than the theatre? Tony, many thanks for the additional point – but one of the things that Screen Plays sets out to explore is how central plays (and occasionally specific productions) adapted from the stage were to the schedules of both BBC and (to a lesser extent) ITV through until at least the the mid-1960s. Nor were they only watched by small ‘elite’ audiences – there are many examples of such adaptations achieving very significant figures, although of course in a world with only two channels. Thanks very much for these valuable comments, Kim! Yes, the differences in production for stage plays on television and plays written especially for television will be an important and enriching aspect of the project. Also, what can we learn about the demographics and experience of the viewing audiences for both these kinds of output from the rich evidence that exists, for example, in the BBC archives? With regard to this kind of case study, it may also be rewarding to pay close attention to production processes and aesthetics for television productions of stage plays on the one hand and fresh re-writings of those stage plays made especially for television (for example, Tom Stoppard’s 1968 Neutral Ground, a loose adaptation of Philoctetes). Certainly, these issues will be extremely valuable in helping us define the terms of our analysis as we proceed. Your point raises for me other interesting questions concerning the involvement of personnel in the production process for television plays and their work in other media: for example, the translators / writers who moved from working on radio productions of ancient plays to television productions. One example is Kenneth Cavander, mentioned above. Apologies for such a long response, but you raise interesting and important points which will well serve us as we move forward at the start of this new project — thanks so much! That was Patrick Stewart in the OU Oedipus? I never knew. I do remember seeing a brief snippet of it. 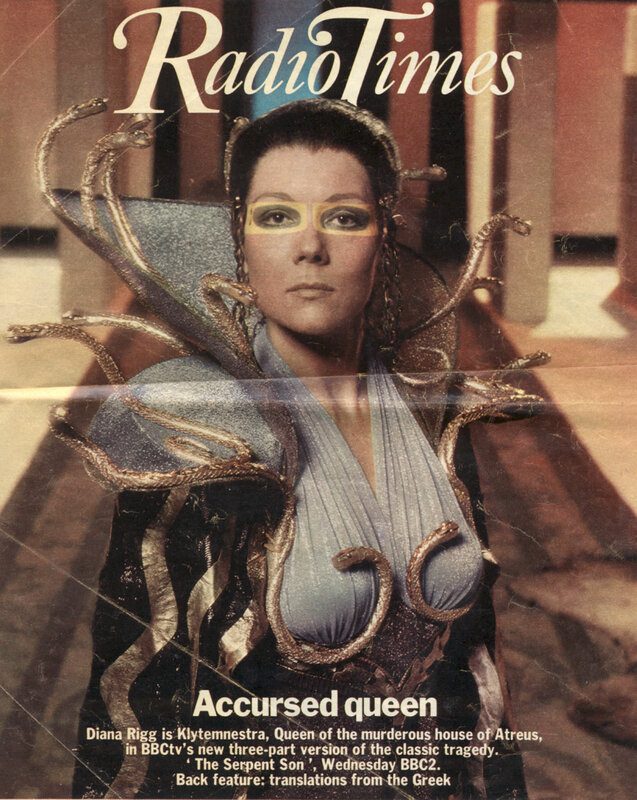 I also very well remember that Diana Rigg Radio Times cover, though I wasn’t allowed to watch the actual broadcast. I still have the pages for the feature inside. On the OU side, I guess Tom Paulin’s Seize the Fire (adapted from Prometheus Bound), prepared for A294, falls outside your remit. The A103 programmes include some on Medea, with extracts from the plays therein, but I don’t think there’s another full-length production (they tended to go for audio performances). Don Taylor’s Iphigenia was meant to be the first of three plays (the others being Women of Troy and Helen), but the other two never got made (though Taylor’s translations were published, and the Women of Troy is regularly used by productions, most recently by Katie Mitchell at the NT). The series The Greeks, that featured Kenneth Dover, included snippets from Clouds, with Freddie Jones as Socrates (at least I think it was that series – it might have been Greek Fire). If I remember anything else I shall let you know. Yes, Tom Paulin’s Seize the Fire does fall outside of the terms of our study (plays originally intended for the stage) but, clearly, knowledge and understanding of adaptations and re-workings for the small screen are going to be crucially important for context. What you say about Don Taylor and the Clouds — great stuff! Noted for further investigation. Warm thanks! I was only twelve! And my mother was strict about my bedtime. Again, don’t know if you know this already, but the translation for The Serpent Son was specially commissioned for broadcast. (I recall it being promoted as a natural heir to I Claudius). The Clouds sequences were specially-shot – Jones turned up in the same programme in an extract from the Symposium, again being Socrates. I heard Don Taylor talk about the Theban Plays in Edinburgh twenty-five years ago now. I don’t recall much, though I do remember him taking an elitist standpoint, arguing that he was making the plays for an audience that didn’t think Dennis Potter was the be-all and end-all of television drama. I can’t remember what I was searching for now, but I did turn up this link some time ago: http://www.neilcurry.com/publications.html. This lists productions of Antigone and Bacchae from the early 1960s. Oh, and Taylor talks a bit about the production history behind the planned War Plays trilogy in the introdcution to his published translation, which is available in Methuen. Tony, this further detail is enormously useful, thank you — especially the signpost to the two further BBC productions on Neil Curry’s website! Your recall of Don Taylor’s position is both impressive and helpful; I’m waiting for a secondhand copy of his Days of Vision to arrive any day now, so I look forward to learning more about him. So far, incidentally, I am finding that the range of viewer experience in relation to BBC television productions of Greek plays seems to be as wide as for Greek plays produced on radio, perhaps as might be expected. So, whatever the intentions behind a broadcast programme, this doesn’t accurately map onto actual individual engagements with it, perhaps (as I have argued elsewhere) because of the lack of boundaries conditioning audience engagements with cultural activity in domestic mass media such as radio and television. Once again, great thanks! Lots to follow up on and think about here. Amanda. I have loved reading your blog and can’t wait for your next posting, but what worries me is that you write about some amazing and challenging productions, both by the BBC and by the independent (commercial) television companies, such as Associated Rediffusion (and, yes, I am old enough to remember them). My point is, what hope is there that we will see productions like that in the future? Who would dare put on tv today a Greek play, in costume and masks in translation or, dare I say it, in Greek? Sue, of course you’re right, and I think it’s highly unlikely that mainstream broadcast television will ever again carry productions like this. But it’s exciting that there are new media forms emerging – I’m thinking especially of projects like NT Live and Digital Theatre – that may well present original productions of Greek plays (as well as many other forms of drama), perhaps from theatres in Britain or perhaps even from the likes of Epidaurus. Thanks, Sue, both for your kind words and the valuable point you raise. As John says, I think we must look to new media forms for fare such as this in the future — and there are some exciting possibilities. Is it too immodest to hope that this work on the production history of stage plays on television — with related activities such as screenings (see the current UnLOCked season at the BFI, for example) — may bring such questions more centrally into current debates? Once again, Sue, thanks very much for your contribution to the discussion! This is very interesting material and has started me researching my own database of films. Thanks again for a good discussion. Thanks, Sally-Ann — this is great to know! We would love to hear what area in particular interests you. Feel free to get in touch over email with either John or myself.